Concerns have been expressed about the possible health effects of living in the vicinity of cell phone towers. The concerns promoted by alarmists fall into two general categories. The first is that EMF from cell towers can cause cancer. The second is that it causes the syndrome of electrosensitivity or EHS. These issues have been the subject of a number of scientific studies and have been examined by a number of public health organizations. Public health organizations such as the WHO have concluded that the overwhelming weight of scientific evidence shows that cell towers cause neither cancer, nor EHS. Despite this, alarmists continue to promote a number of the same discredited unscientific "studies". In this and related pages, we will review some of the important scientific studies, and expose the flaws in some of the "studies" that are promoted by the alarmists. The level of exposure to the general public, even for those living in close proximity to a cell tower, is at least 50 times lower (usually thousands of times lower) than established safety limits. The following is a quote from the WHO Fact Sheet on cellular base stations: "Recent surveys have shown that the RF exposures from base stations range from 0.002% to 2% of the levels of international exposure guidelines, depending on a variety of factors such as the proximity to the antenna and the surrounding environment. This is lower or comparable to RF exposures from radio or television broadcast transmitters." To be exposed to the established safety limits, one would need to climb the cell tower and stand within a few feet of the antenna. See the following extract from FCC OET Bulletin 56. Note that the existing exposure limits already have a safety factor of 50 for the general public. 1. The WHO has published a fact sheet on cellular base stations and wireless technologies. The following is a quote from this fact sheet: "Over the past 15 years, studies examining a potential relationship between RF transmitters and cancer have been published. These studies have not provided evidence that RF exposure from the transmitters increases the risk of cancer.....Some individuals have reported that they experience non-specific symptoms upon exposure to RF fields emitted from base stations and other EMF devices. As recognized in a recent WHO fact sheet "Electromagnetic Hypersensitivity", EMF has not been shown to cause such symptoms. Nonetheless, it is important to recognize the plight of people suffering from these symptoms." 2. The study entitled: "Mobile phones, mobile phone base stations and cancer: a review" by Moulder et al. is a review of multiple studies on mobile phones base stations and cancer. The study appeared in the Int. J. Radiation Biology, Mar. 2005. The following is a quote from the abstract. "There have been reports in the media and claims in the courts that radiofrequency (RF) emissions from mobile phones are a cause of cancer, and there have been numerous public objections to the siting of mobile phone base antennas because of a fear of cancer. This review summarizes the current state of evidence concerning whether the RF energy used for wireless communication might be carcinogenic". The following is a quote from the section Epidemiology of RF energy and cancer on P. 5: "Several of the early studies reported some associations of RF energy with haematopoietic or brain cancer. However, as other reviews have noted, these studies had limitations in design and exposure assessment, and their evidence fell short of supporting a causal role for RF energy. More recent cohort studies (Hill 1988, Morgan et al. 2000, Groves et al. 2002) are considerably larger and include better exposure assessment". The paper goes on to explain that none of these more comprehensive higher quality studies found any evidence for cancer. In addition to cell towers, no evidence for cancer was found near much more powerful FM and TV transmitters. From the Abstract: "Overall, a weight-of evidence evaluation shows that the current evidence for a causal association between cancer and exposure to RF energy is weak and unconvincing." 3. The SCENIHR scientific advisory body to the European Commission has released a comprehensive new report (Jan. 2009) entitled Health Effects of Exposure to EMF. The following is a quote from the section on Radio frequency fields (P. 25): "Recent well-conducted epidemiological studies provide evidence against an association between RF-EMF exposure from broadcast transmitters and the risk of childhood leukemia. Although new exposure sources such as mobile phone base stations, cordless phone base stations or wireless networks are relatively recent, exposures from these sources are generally lower than the ones investigated in these studies on broadcast transmitters. Thus, there appears to be no immediate need for further studies related to these sources." 4. The American Cancer Society has published an information bulletin on their web site on Cellular Telephone Towers. 5. A study entitled Mobile base stations and early childhood cancers: case-control study by Elliott et al. in the British Medical Journal (June 22 2010), investigated the possible link bewteen living in proximity to a cell phone tower and early childhood cancers. Subjects were studied from the onset of pregnancy until the age of four years. The conclusion: "There is no association between risk of early childhood cancers and estimates of the mother's exposure to mobile phone base stations during pregnancy". 1. A Double Blind Study on EHS individuals exposed to mobile base station radiation showed that they were unable to detect real radiation from sham radiation. This study is consistent with another fact sheet on EHS by the WHO. The WHO concludes that individuals are not affected by EMF. Their symptoms may be due to psychosomatic or other factors. The results of this study are similar to the results of at least 31 other double blind studies on EHS individuals. 2. A Two Part Study of EHS like health effects on people of living near cell towers in Germany has recently been published (Feb. 09). These are the largest and most comprehensive studies of their kind to date. 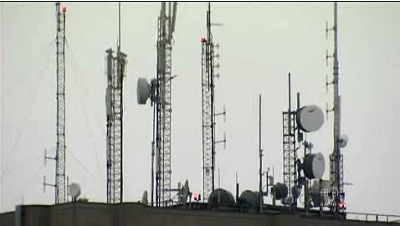 The studies evaluated the EHS symptoms of subjects living near cell towers. In phase 2 of the study, actual EMF measurements were made inside the homes of 3526 subjects. The EMF levels from nearby cell towers as well as cordless phones, WiFi, and radio and TV stations were measured. The subjective sense of well being was evaluated using a questionnaire. It evaluated symptoms similar to those experienced by EHS individuals. Residents who considered themselves electrosensitive, possibly electrosensitive, and not electrosensitive were included in the study. No correlation was found between "sense of well being"/EHS symptoms and level of EMF for any type of resident. Link to Part 1 & Link to Part 2 of the studies. The following is a quote from the Discussion of Part 2: "We did not observe any association between RF-EMF exposure and five different health disturbances, measured with standardized questionnaires, namely sleep disturbances (PSQI), headaches (HIT-6), health complaints (von Zerssen list), and mental and physical health (SF-36). This was true both for RF-EMFs at mobile telecommunication frequencies (GSM900/1800, UMTS) and for total RF-EMFs, including also exposures from TV and radio broadcast towers, cordless phone base stations, and Wi-Fi." The following is a quote from the abstract of Part 2: "Conclusions: In this large population-based study, measured RF-EMFs emitted from mobile phone base stations were not associated with adverse health effects." 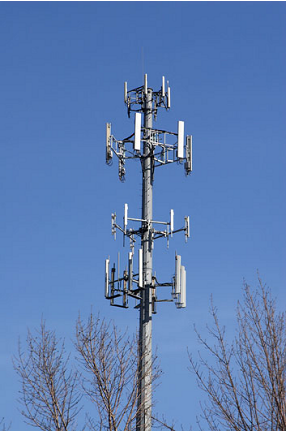 One of the concerns raised by alarmist groups is the amount of EMF power emitted by cell phone towers. Pictured above is a collection of cell phone base station antennas and microwave relays on the roof of a building at Brock University in Ontario Canada. This installation has been the subject of a number of attacks by alarmist groups. It was also featured in an alarmist TV "documentary" on Radio-Canada. According to the Découverte program on Radio-Canada the total power from this group of antennas is 2000 watts. While we're on the subject of EMF power, the power output of a typical WiFi device is under 100 mW or 0.1 W, which is 20,000 times lower. Alarmists claim that transmitters such as the ones at Brock University, and even WiFi devices, can cause health effects ranging from fatigue and headaches, all the way to brain cancer. But as noted in the SCENIHR statement quoted above, many radio and TV stations which have been operating for more than 60 years are far more powerful sources of EMF. A typical FM radio or TV transmitter might produce 50,000 watts, which is 25 times greater than the antenna cluster at Brock University. Certain short wave transmitters such as Radio Vatican and Voice of America have operated at 500,000 watts, which is 250 times greater than the same cluster. Numerous studies have been done of residents living near such transmitters. As the paper by Moulder et al. makes clear, no evidence for cancer or other adverse health effects has emerged from these studies. However, what is more important than the absolute power from the transmitter is the actual exposure level to the public. This depends on many other variables such as the directionality pattern of the antenna, distance, absorption and reflection from other objects, etc. Since cell phone antennas focus their energy in narrow beams aimed at the horizon, exposure levels near such towers are much lower than ICNIRP limits. 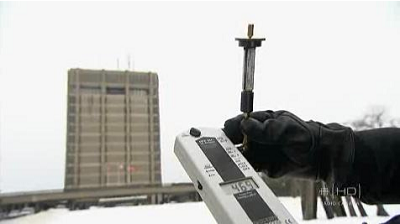 In the alarmist Radio-Canada Découverte program, the measured level of EMF was 10,000 times lower than the internationally recognized ICNIRP limit. The highest level reported by the alarmist group SEMO, after extensive measurements in the Montreal metropolitan area, were 250 times lower that the ICNIRP limit. Some of these measurements were in areas immediately adjacent to cell towers.